The MSL series 1 is the ideal minor procedure and examination light for any healthcare environment. Multiple mounting configurations are offered in this comprehensive and high quality range. Locally manufactured in-house from premium grade materials, it is a durable purpose built design to assist the user that requires exceptionally good light. 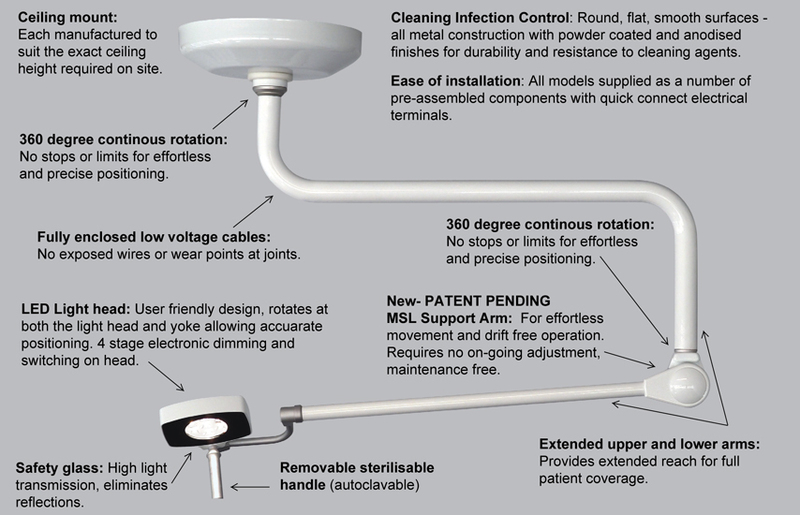 Series 1 ceiling offers continuous 360° rotation around the upper ceiling joint, providing maximum reach and range of movement for full patient coverage. With a sweep of 3160mm the Series 1 wall model maintains full patient coverage with the space saving design that can be folded back to the wall when not in use. The Series 1 medical examination light is available with various mounting options.